A long space draped in sleek darkness. Black, charcoal, greys. Near a window, an elegant, circular Houtlander chair seats four or five people. Dining chairs are James Mudge; bar seats in leather are by Dark Horse. 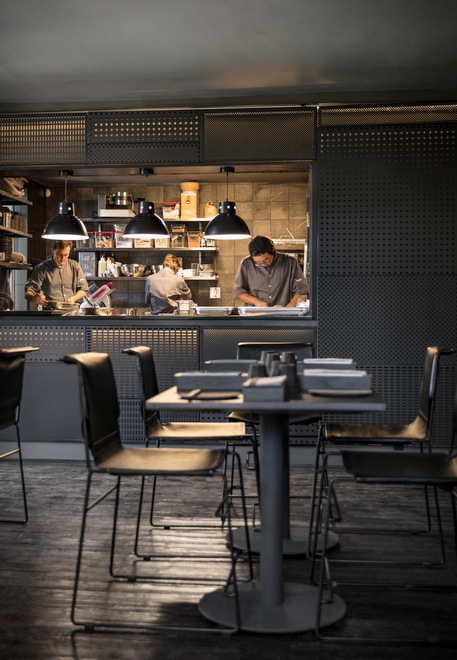 Wines, homemade charcuterie and cheese are on display as you walk through the maze of dining spaces and past the open kitchen – nearly everything is encased in black or charcoal with thin, vertical stripes defining the detail. Charcoal ceramic plates. Darker pendant lights. A colourful wall mural of flowers breaks the monochrome. 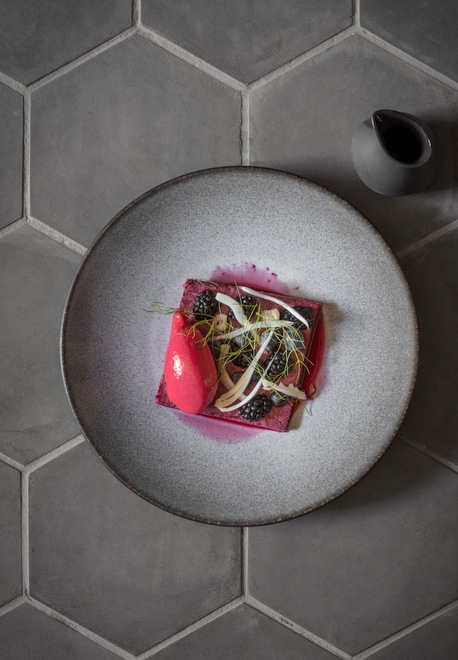 Arno Janse van Rensburg and pastry chef Liezl Odendaal established Janse & Co restaurant in December 2017. Its urban, fast-paced inner city location is quite a change from his last cheffing post at The Kitchen at Maison in Franschhoek’s countryside. The narrow venue used to be an Ocean Basket fish eatery. Source Design has transformed it with dramatic flair and created visual sophistication. The street entrance is almost hidden. Janse van Rensburg enjoys being part of this urban pavement blur of restaurants, burger cafes and bars. “Cape Town is not a massive city. Evenings are nice and busy,” he says. 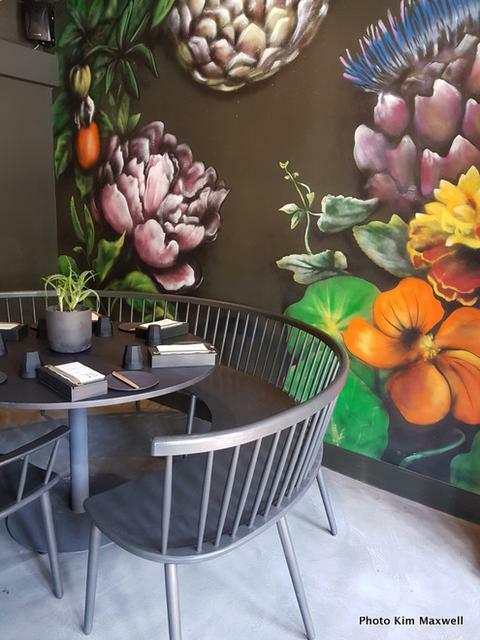 “I think I got a bit lazy in Franschhoek where I worked lunch only.” Janse & Co serves lunch and dinner. So is a “casual fine dining experience” and an ingredient-led menu a good fit in this buzzy, younger part of town? 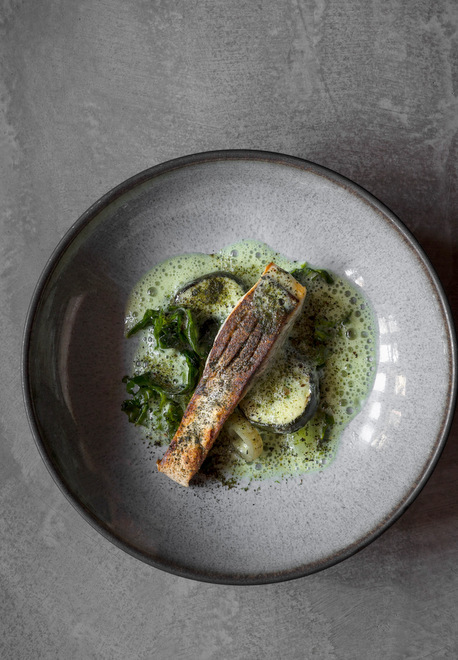 Bree Street’s Chefs Warehouse probably started the casual-vibe-meets-finely-crafted-food trend in Cape Town restaurants, their kitchen serving the chefs’ choices of eight mini dishes to two diners, the skill in their finely crafted cuisine. 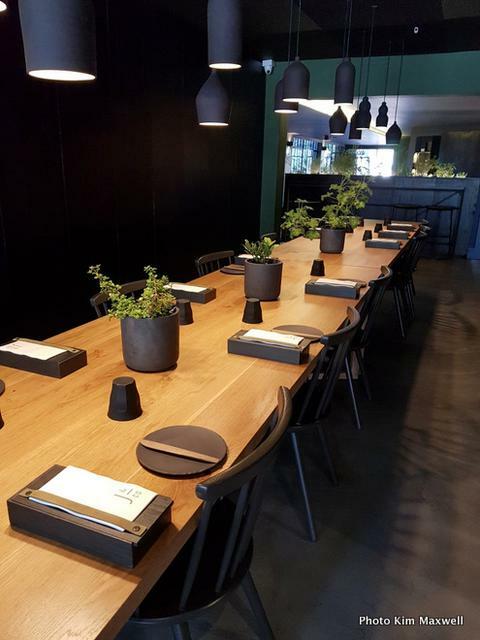 Janse & Co’s crafted food style includes contemporary innovations alongside some classics. As a diner you’re invited to eat two or even five courses per person at lunchtime. The defining difference being that Janse & Co diners select their preferences from a small printed menu. So two of you could sample three or four courses each (duplicates or each one different) and throw in only one dessert in that savoury mix. At a shady courtyard table, four taster courses (including one shared dessert) at R445 per person, felt about right. We paired it with interesting wines by the glass including food-friendly Fledge Vagabond white blend and a lighter Swartland Independent red, The Blacksmith Cinsault. A selection of Odendaal’s homemade breads and unusual crackers with Janse van Rensburg’s four cured salamis and sausages made for a compelling start. Smoked geelbek in a creamy lemon aioli under fresh persimon shavings was fresh. Then a fairly adventurous option: sweet, homemade granola mixed through diced, tart quince and green beans under grated shavings of frozen duck liver parfait. I liked it; some may not. What the restaurant calls courses are small dishes, so hearty eaters might leave a little hungry with the two-course menu (R245 per person) if they’re settling in for a while. The flat white is good and the service informed without being demanding. Dessert fans will be happy with the flavour fit of Odendaal’s passionfruit sorbet with honeycomb and milk chocolate “Aero” chunks. My husband loved the classic notes of beef brisket best, slow-cooked to tender with roasted shallots, capers and spinach swimming in a delicious jus, onions dehydrated into a sticky-sweet sheet on top. My favourite was simplicity itself: vegetarian potato ribbons softened in vegetable stock and warmed through with butter, on diced avo. What took it up a notch was a salty seaweed dusting of “klipkombers”. It’s a seaweed that clings to rocks.